The roundel depicts a beardless bishop saint, with halo and bishop's mitre, seated on a cloud-bank reading a book. He wears a monastic habit. The frame is composed of a garland of fruit and vegetation (pine-cones, aubergines, lemons, apples, pears, pomegranates, plums, grapes, chestnuts and various leaves), bound with blue ribbons and developed counter-clockwise. Its inner edge is bounded by an egg-and-tongue moulding, and its outer edge is freely developed. The roundel was originally one of a set of four representing the Four Latin Fathers of the Church, which apparently were all from about 1890 in the hands of the Florentine dealer Stefano Bardini. Two of these were acquired before 1898 through Julius Böhler of Munich by the Berlin collector James Simon, by whom they were given in 1904 to the Kaiser-Friedrich- Museum, Berlin: they are today in the Skulpturensammlung, Bode-Museum, Berlin. The present roundel was bought from Bardini in 1896 by Prince Johannes II of Liechtenstein, and the fourth roundel is untraced. Of the two Berlin roundels, one represents St. Gregory the Great, identifiable by his papal tiara, while the other represents a bearded Father wearing a bishop´s mitre. Of the two roundels in which the Father is represented wearing a mitre, that in Berlin and the present one, one must represent St. Augustine and the other St. Ambrose. The lost fourth roundel would have represented St. Jerome. The respective identities of the Berlin bishop Father and of the bishop Father represented in the present roundel are disputed, Marquand identifying the Berlin Father as St. Augustine and the Father of the present roundel as St. Ambrose, and SchottmüIler that in Berlin as St. Ambrose, and, by implication, that of the present roundel as St. Augustine. 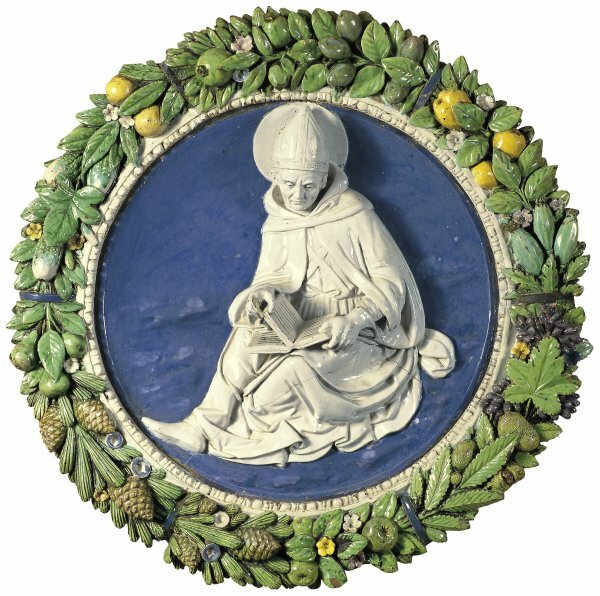 Pace Marquand, the fact that the Father of the present roundel is wearing a monastic habit, while that of the Berlin roundel is not, indicates that it is St. Augustine who is intended here. In the BerIin roundels St. Gregory faces to the viewer's right, while St. Ambrose faces left. Since in the present roundel St. Augustine faces left, it may be assumed that in the lost fourth roundel St. Jerome would have faced right. The garlands surrounding all three published roundels comprise the same elements, representing an unusually wide variety of fruits, but while the garlands of the Berlin roundels are developed in the clockwise sense which is more usual in roundels from the della Robbia shop, that of the present roundel is developed counter-clockwise (one may perhaps assume that the garland of the lost four roundels was also developed counter-clockwise, thus making the four roundels of the series complementary). Schottmüller assigns the roundels to the workshop of Andrea della Robbia, with a dating around 1500, while Marquand assigns them to the hand of Andrea with a dating in about 1480-1490. Their generally high quality and accomplished composition indicate that they are not mere run-of-the-mill workshop productions: in particular the precise rhythmic articulation of the bunches of fruit in the garlands seems to imply the direct involvement of Andrea himself. The intervention of assistant hands can perhaps be seen in the egg-and-tongue mouldings on the inner edges of the frames, which are, by contrast, perfunctory in execution. Comparison of the frames with those of dated stemmi by Andrea and his shop would seem to indicate a date of execution in the region of 1490. A comparison with the frame of the stemma of the Arte della Lana in the vault of the entrance hall of the Opera del Duomo, Florence, documented to Andrea and dated to 1486-1487, is especially persuasive.